Bill took up refereeing after sustaining a shoulder injury while playing rugby in both Union and League in his youth and senior levels. 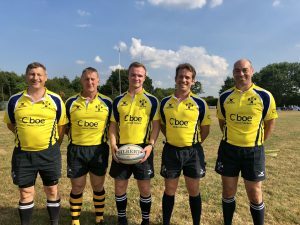 Bill quickly developed his refereeing with Kent Referees Society after having been invited onto the senior development squad. He then moved onto the South East Federation where he is just beginning his third season. He is now looking to push onto getting his level 6 this season and regularly refereeing London 1 rugby. Bill has grown as a referee over the last 4 years and has been selected twice to referee one of the Kent County Finals and has become a confident, capable referee at a young man of 21. Having crafted his referee skills he is now reaching out to gain more experience helping out the London Referees Society at the recent Slough Sevens event and was rewarded with the appointment of referee for the men’s elite final. Always happy to pass on his knowledge to assist the next generation he is also active as a referee coach to our junior development squad. Well done Bill!